Here's a lovely weekend breakfast that is delicious, hearty, and easy to make. It was born of my need to use up a bunch of red kale that was about to outlast its welcome in my crisper. There was a sweet potato that was reaching that point as well, so I decided to put them together on Sunday morning for breakfast. A breakfast hash seemed the perfect way to use them both. I decided to cook them up with some onion and white wine. I started to think about other things that I could add, but I liked the idea of keeping it simple and easy, especially for a Sunday morning meal. That turned out to be a wise decision. The Sauvignon Blanc I had on hand was the perfect complement to the sweet potato and kale, and it was perfect with just those few ingredients. I used red onion because I had some leftover from a previous dish that also needed to be used, but any old onion will do. Shallots would be good. The first morning I topped it with a soft-boiled egg and ate it with my last piece of focaccia, which I toasted. That made for a satisfying breakfast, indeed. That evening I made some brown rice to accompany another dish that I then decided did not need it, so I thought it might work with the sweet potato and kale hash, a la Tacu Tacu, so I used that the next morning and topped it with a fried egg. It worked beyond my wildest expectations. This is quick and easy enough to make for any breakfast, but it is delicious and fancy enough that it can be used for special occasions as well. And it has the added bonus of being a healthy dish as well. A note about the kale if you are not familiar with it. Although the leaves will wilt after five minutes, it will still be quite chewy. That is something I like about kale. If you like your greens soft, I would recommend that you go with Swiss chard or spinach. Either would work just as well and the greens will be more tender. Heat oil in large skillet over medium high heat. Add the onions and the kale stems and 1/2 teaspoon of salt and 1/4 teaspoon of pepper and cook until the onions are translucent, about 5 minutes. Add the sweet potatoes and cook for another 10 minutes, stirring often. Add the wine and the water. If the liquid cools down the skillet, let it come back to a boil. Reduce to a simmer, cover, and cook for 10 minutes, until the sweet potato is tender. Remove the lid and add the kale greens. Cook, stirring frequently, until the greens have completely wilted and whatever liquid remains has evaporated, about 5 more minutes. 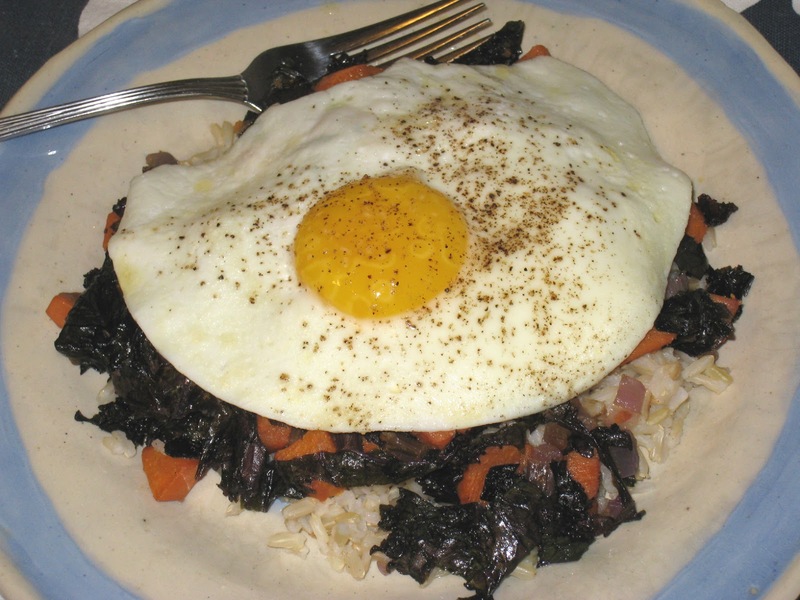 Adjust for seasonings and serve immediately over rice with a fried egg on top.